We host regular workshops, specialty classes, and events to deepen your practice in a community setting. Payment is required at the time of registration and GST will be added to the price. We often require a minimum number of participants to run a workshop, so if you are considering attending, please register one week prior to avoid disappointment. Through the practice of yoga postures, breath awareness and mindfulness techniques, yoga can help youth access skills to bring stability into their lives. These years can often be a time of change and uncertainty and yoga is a wonderful way to be able to calm the mind and center oneself. These classes will include active, fun poses as well as gentle restorative postures to help burn excess energy and reduce stress. The skills learned through this series will be transferable to everyday life. 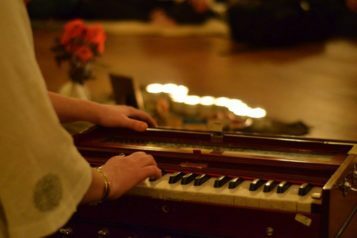 Kirtan is a form of Bhakti (devotional) Yoga where community gathers to share in call-and-response chanting, therein discovering that which unites us to each other. Most of the chants are in the ancient but timeless Sanskrit language. These sounds vibrate within the physical and subtle body, quieting the mind and purifying the heart. No experience is necessary, and song sheets are provided. Jivamukti Yoga, developed by Sharon Gannon and David Life , offers the contemporary yogi a creative approach to living in the world today. Grounded in the ancient scriptures and ethical practices of yoga, Jivamukti, a Sanskrit word which means “living liberated,” is a practical philosophy that teaches how spiritual values can help us work with the challenges of everyday life with more joy, compassion and positive effectiveness. Jivamukti Yoga offers vigorously physical and intellectually stimulating yoga classes. Classes include Vinyasa (flowing asana sequences), hands-on adjustments, Pranayama (breathing exercises), meditation, Sanskrit chanting, Yogic philosophical teachings and deep relaxation with music playing an integral role in the class. 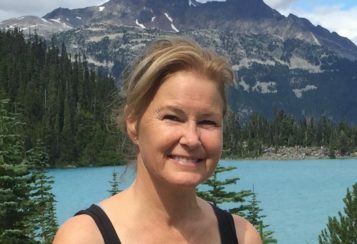 Join certified Jivamukti Teacher Jonni-Lyn Friel for this fun, uplifting and challenging class. The class will be themed around the Focus of the Month “Let Your Soul Be Your Pilot”. Cultivate deep relaxation through the combined therapeutic power of Restorative Yoga,Thai massage & a Loving-Kindness practice. During this special 2-hour class, while being guided through a series of relaxing, restorative yoga poses, you will receive Thai massage therapy. The combination of yoga and massage allows you to let go of deep tension, breathe more deeply, and almost effortlessly flow into bliss. The loving-kindness practice offers us a chance for deep self-nurturing and supports our subtle body. This combination will open the practitioner to experience benefits on a physical, mental and energetic level. Wear comfortable, layered clothing and leave all your cares at the door. Class size is limited to ensure quality massage time. This event usually sells out, so be sure to pre-register! Do you sometimes feel like you “take on other people’s stuff”? Does being around groups leave you fatigued, ungrounded, or overwhelmed? Are you a practitioner or teacher who has difficulty leaving your clients’ issues behind? • Understand the nature of the energetic body and how it is influenced by the world around us. The class will consist of lecture, meditations, and dynamic movement exercises. 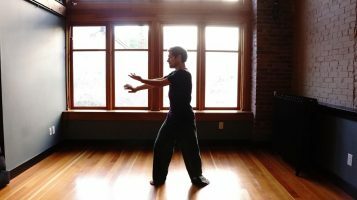 The practices and teachings are rooted primarily in the Medical Qi Gong tradition as passed on by Dr. Jerry Alan Johnson. Aaron Banfield is an Acupuncturist and Medical Qi Gong practitioner. He has been in practice for 10 years, identifies as a Highly Sensitive Person, and has found these practices extremely helpful. Yoga is medicine. Yoga is Self-Care. In today’s world, we can all relate to thoughts, emotions and body sensations related to anxious states. We live in a world of false refuges claiming to reduce the anxiety we feel on a daily basis. We all have habitual ways of coping-some ways are more skillful than others. Yoga offers a systematic, time-tested approach to meeting our current state of being. Yoga is a skillful and nourishing approach to meeting these states. This 6-week series will provide students an opportunity to practice asana (postures), energy expansion using the breath (pranayama) and meditations that can be used in our daily round. 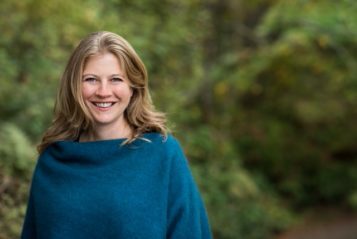 Classes will include psycho-education on working with anxiety based on the Yoga sutras, Somatic Experiencing (SE) and Mindfulness-Based Cognitive Therapy (MBCT). Everyone welcome. No prior Yoga experience is necessary. Come learn meditation and explore the wisdom teachings of the Bhagavad Gita, a classic yogic scripture. The Bhagavad Gita is one of the most studied and renowned books about spirituality in the east. It teaches in depth about how to be and act effectively, powerfully and freely in your life. Discover meditation, breath work and philosophy in this 90 minute class with Padma. Enhance your happiness and brighten your awareness. No meditation experience required and experienced practitioners are most welcome. 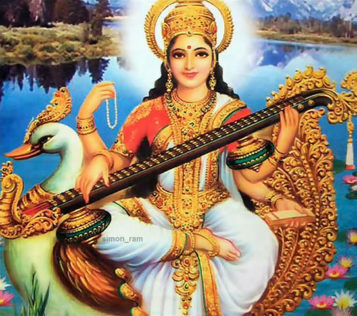 In Hindu Mythology, Saraswati is the Goddess of music, wisdom, creativity & learning. Like all of the numerous deities in the Hindu pantheon, the Goddesses and Gods represent “energy signatures” which are potential energies within us all. We can cultivate these energies and the qualities of the Goddess through visualization in our Hatha practice, by Mantra chanting, Yantra, Mudra and Meditation. The majority of this class will be a Saraswati themed Hatha Yoga practice. You will also learn some of the mythology of Saraswati, as well as how to invoke her through intention and through visualization while practicing “japa mala” meditation. When we summon the energy of Saraswati into our lives, we invoke the blessings of grace, wisdom and creativity. Please bring a mala if you have one as well as a notebook & pen to the workshop. Handouts and/ or electronic information will be provided to participants. This workshop is part of a series exploring the Divine Feminine. Each workshop will explore a themed Hatha practice around one of the major goddesses of Yoga.Each workshop aims to explore these deities and give us tools to invoke their qualities of Shakti into our lives. – If you cancel 7 days prior to the event, we can offer you a full refund or credit at Hemma. – If you cancel within the week prior to the event, we can offer you a credit at Hemma, minus a $5 administration fee. – If you cancel the day of the event, or don’t show up for it, no refund or credit will be offered. – It is rare that we cancel a workshop, but if we do we will give you 24 hours notice and offer you a full refund or credit at Hemma.